The world famous Italian tenor is set to sing at the King Power Stadium before kick-off of this Saturday’s Premier League meeting with Everton. 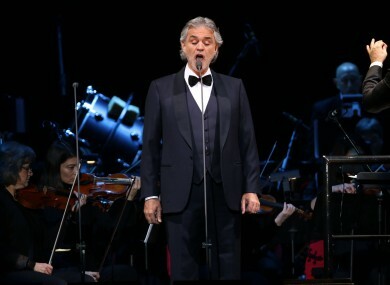 Bocelli will sing the likes of Nessun Dormo and Time To Say Goodbye. LEICESTER CITY WILL celebrate their dream Premier League title in style on Saturday with a pre-match party involving world famous tenor Andrea Bocelli. The Italian singer will serenade the Foxes’ title-winning players before Saturday’s home game with Everton, after which they will collect the Premier League trophy following a fairytale triumph that was clinched on Monday. Bocelli will perform at the King Power Stadium as a personal favour to his fellow Italian Claudio Ranieri, Leicester’s title-winning manager, and other special guests at the game will include the club’s famous Ice Kings of the 1960s. Ranieri was applauded on Thursday at his first pre-match press conference since his side were crowned champions, as more than 100 journalists raised glasses of champagne to toast the popular 64-year-old. And he revealed plans for Bocelli’s performance were born around two months ago, long before Ranieri conceded publicly that his side were title contenders. Then I give all my info to the club and they made all the arrangements and everything –- for all of Leicester and the community. Bocelli will begin the afternoon’s celebrations on Saturday while the Ice Kings — the Leicester side who narrowly missed out on the old First Division title in 1963 — will be presented to the crowd at half-time. Leicester captain Wes Morgan will receive the Premier League trophy after the game. Thursday’s light-hearted press conference continued a week of celebrations for Leicester, who were confirmed as champions when second-placed Tottenham Hotspur could only manage a 2-2 draw with Chelsea on Monday. Email “Andrea Bocelli is performing at Leicester's title party as a favour to Claudio Ranieri”. Feedback on “Andrea Bocelli is performing at Leicester's title party as a favour to Claudio Ranieri”.